The Government is to investigate how many wild boar are living in north Wiltshire after a motorist died after hitting one on the M4 through the county. The chairman of Natural England, Andrew Sells, confirmed his department would be sending an expert to join a local deer initiative, with the specific remit of finding out just how bad the wild boar problem is in the farming country north of Chippenham and in the Bradon Forest, near Malmesbury. What are We going to do about the wild boar Problem? Where have we heard this kind of language before? It often comes out as a justification just before further atrocities are committed towards an already long-persecuted population. What are We going to do about the Jewish Problem, the Gypsy Problem, the Badger Problem, the Rabbit Problem… etc. Who does the ‘we’ refer to and who gave ‘us’ the authority to arbitrarily deal out death in this matter? Their population growth has been such in the Forest of Dean that there is now an annual cull, as gardens, parks and football pitches are dug up by the boar. Our chosen haunts – those We create and maintain through great and continuous labour – take precedence over Theirs (wild boar are a woodland animal and their disturbance of the soil actively favours the growth of saplings in areas where grass otherwise dominates). When They invade and upset Our carefully laid schemes they forfeit their right not just to passage in those areas but to their lives even in those scraps of woodland which We (in our temporary beneficence) have allowed to persist. The action comes after the tragic death of Raymond Green, a 47-year-old from Royal Wootton Bassett, whose car hit a huge wild boar on the M4 near junction 17 and was then hit by a lorry in the first week of January. There is a snarl behind the word ‘feral’ and further coded meanings behind the word ‘wild’, despite the attempts of some to rehabilitate them in a more positive light. At the heart of it lies disavowal: We are not ‘wild’ or ‘feral’ animals, and this is where our judge, jury & executioner authority comes from. We have cultivated ourselves just as we have cultivated the land and are now domesticated and civilised – or more correctly domesticating and civilising because the process is never complete and never unresisted. And yet the word ‘feral’ describes Us down to a ‘t’ if you take it to mean an animal that has not discovered its place in the ecosystem, and which (until it manages to do this) causes great damage to the native flora and fauna leading to simplification and ecological impoverishment, with only the strongest and most flexibly adapted capable of resisting its onslaught. But the disavowal allows Us to ignore all that we have in common with these wild boar, which we in turn perceive entirely in terms of Them, which permits us to go on destroying them or keeping them down (it’s always a pushing down, coming from a fear of what may rise up after such long repression) as we see fit. That’s the point of this article. What parallels can we draw between their rewilding experience and our own? How can we make alliances and start to protect them (and maybe have them protect us)? ‘Ineffective and inhumane’ – or in denial? Back in media-land the insanity on the badger cull continues (see previous post). I was unfortunate enough last Friday to witness this Channel 4 news report on a ‘scientific assessment’ which called the recent pilot culls in Gloucestershire and Somerset ‘ineffective’ and ‘inhumane’. It struck me as a classic example of media framing – laying down (and subsequently policing) the boundaries of public discussion to extremely narrow parameters in a way that benefits the powerful. So, for example, you hear respectable commentators talk about the 2003 Iraq war and polarise the debate between those who view it as ‘justified’ and those who think it was a ‘miscalculation’. You hardly ever hear the conclusion that the evidence supports – namely that it was a deliberate act of criminal aggression. Likewise, with the negative effects of ‘austerity’ in the UK (dismantling of the NHS, removal of benefits, pay freezes, public sector job losses), at the liberal extreme these are most often presented as a failure or a mistake on the part of politicians, but practically never as intentional, cynical policies to further reconstruct the economy as a channel of wealth from the poor (and middle-classes) to the super-rich. 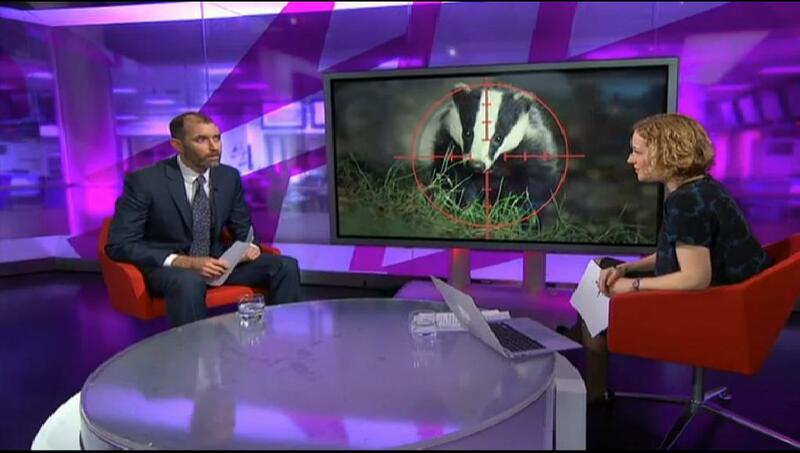 So how does this apply to the badger cull, as discussed in this particular Channel 4 bulletin? Well first off presenter Cathy Newman passes on the government’s stated justification for the cull without criticism – we are to believe from the start that the cull was ‘aimed at tackling the spread of TB in cattle’ and everything that follows rests on this premise. Other possible motivations such as irrational hatred of wildlife, scapegoating and displacement of responsibility on the part of the farming lobby and a willingness of the political establishment to ‘offer [them] a carrot’* don’t merit consideration. What we now know is that they managed to fail on several of these counts. 50% [is] an important number because that’s actually getting down to the point at which this policy could in fact cause more TB to spread around than not. This cull has been an absolute disaster. They’ve only killed a fraction of the badgers they thought they would be able to kill. [T]he one thing that struck me is how impossible it must be – it’s dark, it’s raining most of the time, it’s thick forest. I’m actually surprised these marksmen managed to kill any badgers at all, let alone cleanly. So I don’t think we should be too surprised that there were some problems. […] This is a complicated, difficult, rather messy business, killing animals. But we’re a society that prides ourselves on our humaneness, especially our farming industry [ha! ], so it makes it hard to justify from a humane point of view. This reminded me of the way the media guides us to empathise with the ‘difficult task’ of the soldiers in the UK’s overseas wars, presenting it as a dry, technical challenge and not speaking of moral culpability when they go about their business of killing defenceless creatures – of their own species (and again for highly dubious reasons which we’re not supposed to scrutinise too closely). Yes, it’s a complicated, difficult, rather messy business, killing Afghans and Iraqis. But we’re a society that prides ourselves on our deep commitment to democracy and human rights, especially our military, so it makes it hard to justify – a tough decision, a difficult job but someone’s got to do it etc etc ad nauseam. However, there is another rather concerning thought. The public outrage and likely direct action against the cull, may distract the media away from something that the government wants to slip through unnoticed. There is little doubt, that it was just this sort of distraction tactic, that lay behind the proposal to sell off the forest which was announced just as the Health and Social Care bill took its first steps through the Commons. I suppose if that’s true I’ve fallen for it, hook line & sinker (although at least I’ve taken it in a direction of my own choosing). But really, I think the major success of this policy has been an emotional one – to lash out in frustration at something that can’t fight back, and to act out destructive urges on something which has no real or immediate value, according to the metrics of the current dominant culture. Now I’m struggling to find a parallel that doesn’t violate Godwin’s Law, but… imagine that you live as a minority group in a racist totalitarian society. There’s an outbreak of epidemic disease which affects a large portion of the population, due mainly to overcrowded living conditions, poor sanitation, malnutrition etc. – basically the incompatibility of the human organism to prolonged city life. Your group is relatively lucky in that marginalisation and prejudice means you live on the outskirts in a somewhat more resilient, rural form of subsistence economy, although you also suffer losses from the city-born epidemic. But when disaster strikes the city founders and leaders (including those who most benefit from its continued operations) quite understandably don’t want to undermine their Great Accomplishments or any future ambitions by drawing attention to the real causes of the epidemic. Instead they divert attention away from themselves by casting an eye for the briefest of moments outside of their sphere of influence until they find someone else they can blame who won’t cause them too many problems. So your group becomes the scapegoat and wild accusations about your inherent uncleanliness or genetic impurity start flying around. You are judged guilty of causing a ‘health risk’ to the broader population either passively (through your supposedly lax standards) or even through active conspiracies (eg: poisoned wells, subversion of the social fabric etc.) So they send the shock troops in to carry out a ‘controlled cull’ of your population. Terror ensues, your way of life is shattered, you can no longer trust anybody any more, you suffer all the symptoms of post traumatic stress as a community. Then one day you hear that some intellectual luminaries in the city opposed this atrocity on the grounds that it was a ‘failed policy’, ‘ineffective’, ‘inhumane’, ‘unsustainable’, ‘economically unviable’. They say that the cull and any future culls ought to be discontinued because it is difficult, if not impossible to ensure that targets of killing 50% or more of the selected populations – your friends and relations – are met. How would you react? On his website, Mr Packham said: “My views on the badger cull are well known and have been widely voiced and published. “They are opinions based on a pragmatic and objective consideration of the current science concerning its efficacy as well as concerns about animal welfare. Because of the prominence of my comments it is obviously impossible for me to be considered impartial as a BBC presenter on this topic. “Impartiality is a cornerstone of the BBC’s practice as a public service broadcaster and I am determined to protect this important aspect of its integrity. Thus I will not be taking part in any discussions about the cull during the forthcoming series of Autumnwatch and Winterwatch. Another example of how thought is controlled in nominally democratic societies†. † – I’m indebted to David Edwards, especially his book Burning All Illusions (aka Free To Be Human) and his work with David Cromwell on the UK website Media Lens for this insight and others. Can you hear the sublimated hatred of all things wild – all things living according to an independent will; all things damaging to our religion of total control; all things reminding us of that which we fought (and continue to fight) so hard to put down in ourselves – the coldhearted militaristic language (‘take them out’), the tight grip of irrational fear (those ‘reservoirs’ of disease), the refusal to countenance reality and plough on regardless (‘No, I’m afraid culling will have to take place.’)? Do you see these things as clearly as I do? Do you find them as disturbing? Some respectable scientists , believe that cattle must meet several conditions before they can catch TB. The argument goes that rather than getting TB immediately they are first exposed to the TB bacteria, the cattle must have most of the following conditions: climate history, certain vitamin deficiencies, compromised immune system, intensive living conditions, high-stress lifestyle, lack of natural immunity to infection and disease, and multiple-exposure to the TB bacteria in a short space of time. In other words, cattle which are raised in natural field-based conditions, with minimum use of anti-biotics and other drugs, low-stress organics lifestyle are much less likely to succumb to TB infection. In organic terms, the higher incidence TB in cattle in the south-west of England is more likely to be due to more intensive cattle-rearing and animal husbandry, than the presence or otherwise of TB-infected badgers. Another aspect is that TB can be passed from one individual to another by contact with infected breaths, coughs or sneezes, or infected urine or faeces. 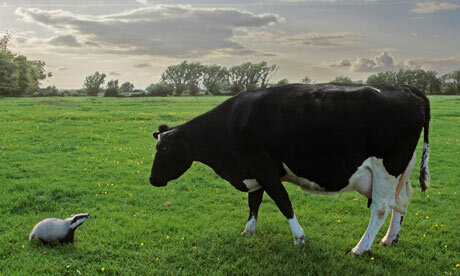 A very good place for badgers to catch earthworms and dung beetles, is in cow-pats. Perhaps, the argument goes, it is the cows who have TB, who pass it to badgers when the badgers snuffle through cow-pats looking for worms and beetles. I bet this is the way it works in most, if not all, instances where wild creatures get the blame for the problems plaguing domesticates. I think that, despite what we hear all the time about ‘weeds’, ‘vermin’ and other undesirable interlopers in the grand schemes of human cultivation†, diseases, parasites and other pathological conditions are actually far less prevalent among robust & resilient wild individuals than among the sheltered, dependent, inbred and highly concentrated populations of domesticated plants and animals. As appears to be the case with endemic Bovine TB, the trouble only comes when the conditions have been created for it through the aforementioned hoarding of biological wealth. The disease manifests as ever more forceful attempts at wealth redistribution. I’ve only seen badgers on a couple of occasions, but that was enough to utterly endear me to their character. I think going after them in this crass, viciously stupid manner (or allowing others to do so when we might have prevented them) can only serve to alienate ourselves further from the wild world at a time when we desperately need to start learning the lessons it has to offer. If we wish to someday beg a home in the spontaneous ecology of this country – ie: woodland – then we will need to apprentice ourselves to those who know how, having done so for many thousands, if not millions of years through an unbroken ancestral lineage. How likely are we to find willing teachers among those whose last contact with somebody who looked like us was through the sight of a gun? Oh, I forgot to say: I support those engaging in direct action against any attempted badger culls. † – you could even apply this to the cultivation of human cultures: as we touched on before, think of all the diseases attributed to ‘inferior’, ‘mongrel’ groups of people such as Jews, gypsies, homosexuals and any strange immigrant culture. How often has this prejudice been used as a justification for campaigns of persecution, even genocide?